Hair Treatment + Nano Mist Steamer Deep Cleansing Scalp Treatment for 1 Person This package includes: • Hair treatment (pick 1): Lemongrass scrub | Hydro spa ice • Nano mist steamer deep cleansing scalp treatment"
Note: These deals are not valid from 1 January to 15 February 2018. 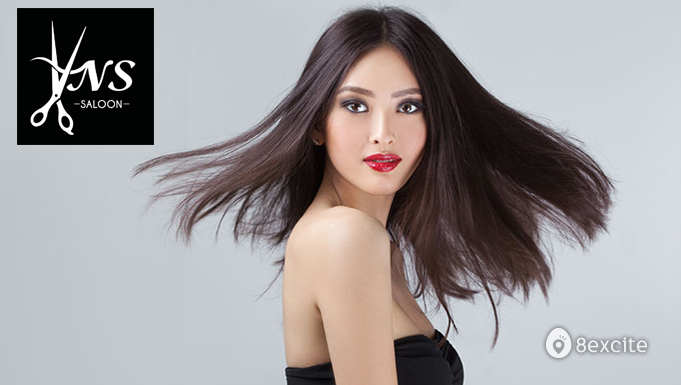 Be it simple or complex hairdos and treatments, you can count on VNS 18 Saloon in Melaka to give you the one of best results. From timeless elegance to head turning appeal, they will make any occasion a day you and others to remember. Let’s not forget about their hair treatments that promotes a better scalp for healthier hair. With every offering under one roof, book an appointment now with VNS 18 Saloon. Valid on Tuesdays to Sundays from 11.30am to 8pm (including Public Holidays). Not valid from 1 January to 15 February 2018. Limited to 1 voucher per customer. Price is inclusive of GST and service charge. Not valid with other offers, promotions and/or discounts. Reservation required and must be made at least 3 days in advance. Call +6016-950 3577 for booking with your Name, Date and 8excite Voucher. Any rescheduling must be made at least 24 hours prior to the date of the original booking. In cases of no-shows on the part of the customer, the voucher is considered forfeit. Reservations and rescheduling are subject to availability. Expired vouchers will not be accepted. No refund will be given for unused vouchers. Present your voucher via the 8excite mobile app at retailer's outlet. No printout required. Vouchers purchased on 8excite are non-refundable unless stated otherwise. For further inquiries, please contact us via Live Chat (9am to 10pm), email us at support@8excite.com or call us at +603-7620 7219 (Mondays to Fridays from 9am to 6pm, excluding Public Holidays).